Less than 25 miles from the beautiful city of Venice, Venice Treviso is a truly underrated gateway to one of the world’s most romantic cities. Enjoy the gondolas, famous Venetian churches and fabulous food of Venice in no time. What’s more if you decide to stay with Treviso, you will be treated to a few of the city’s own gems. Canals – Its waterways are what gives Venice its unique and beautiful appeal with the most famous being the Grand Canal, the centre of Venetian life. Treviso – Stay within this great city itself and admire its beautiful waters, impressive medieval city walls and quaint streets, giving you a fantastic, alternative taste of Northern Italy. Piazza San Marco – Truly unmissable, it is the city‘s largest square where you will find beautiful and historic architecture, a buzz of life and the Bell Tower, Venice’s highest point. Wine – The Vento area around Venice is known for its outstanding wine-growing so if you love your red wine or enjoy a glass of prosecco, Venice has the perfect selection. 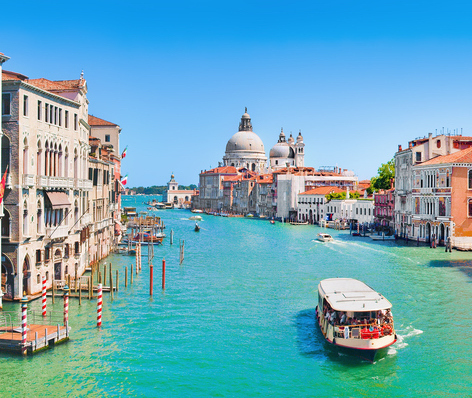 There is no denying that many simply land in Venice Treviso Airport and head straight to Venice and it is unsurprising why: Venice is a true stand out destination in Northern Italy. Stunning Renaissance architecture is everywhere you look. Be sure to spend time in Piazza San Marco, home to Basilica di San Marco with its stunningly beautiful façade filled with glorious art work, or why not cross the Ponte di Rialto, the most famous bridge in Venice, spanning across the width of the Grand Canal. There are dozens of churches to visit in Venice, each with its own charm and history. If you have time to visit only one, make sure it is the Basilica di Santa Maria della Salute. Outside, the church is adorned with carvings and decorations around its large dome, inside you will find beautiful paintings by Titian and Luca Giordano. Alongside its beautiful architecture and ambiance, another fantastic appeal of the city is its delicious cuisine from a wealth of superb fresh seafood to some of the best wine that Italy has to offer. With Lake Garda, Verona and Treviso itself on your door step, you can explore this fantastic region of Northern Italy. Why not relax at Lake Garda, known for its incredible scenery and tranquillity. Furthermore not far from here is another true romantic Italian city Verona; filled with beautiful structures, stunning frescos and the stunning Basilica of San Zeno Maggorie, one of the finest examples of Renaissance architecture in Northern Italy. Or, explore the picturesque and friendly city of Treviso which boasts fantastic shopping and the beautiful social hub of the Piazza dei Signori.